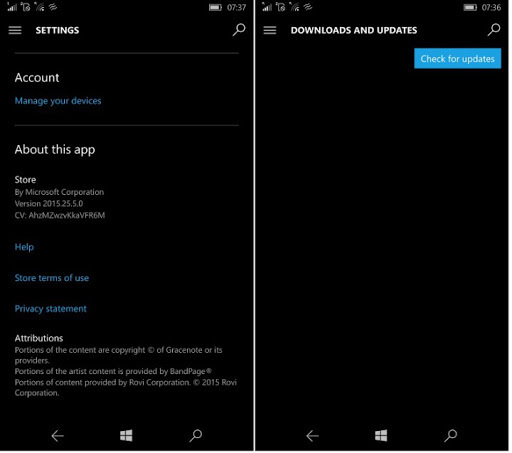 Microsoft today updated their Windows store app on Windows 10 mobile. The Windows store has been updated to version 2015.25.5.0. This update brings some improvement to the UI of store. If you go to store > Downloads and updates section. You will see that "check for updates" button has been moved to the top of the screen. Maybe Microsoft thinks that it will easy for one handed use of phone, so I think they have move the button to the top. But as there is no change log listed on store for this update so maybe this update also bring some bug fixes. You can get this update by navigating to Store > Downloads and Updates. Does our readers like this new improvement to the Windows store app, let is know in comment section below.